Sutcliffe Galleries is a long established family business, dealing in fine paintings from the 18th century to the present day. For three generations Sutcliffe Galleries have advised on all aspects of collecting paintings, including conservation, framing, hanging, lighting and insurance. Sutcliffe Galleries have built up over sixty years, an enviable reputation for integrity and expertise, whether advising on a single purchase or in forming an entire collection for a client. 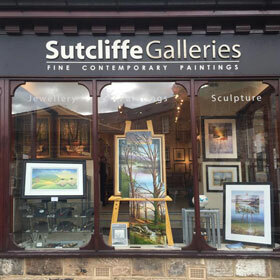 Located in the beautiful spa town of Harrogate, Sutcliffe Galleries is a long established family business, dealing in fine paintings from the 18th century to the present day. For over six decades, three generations of Sutcliffe Galleries have built up an enviable reputation for integrity and expertise, whether advising on a single purchase or in forming an entire collection for a client. Son of the founder, George Sutcliffe, Gary Sutcliffe is the senior partner and principal buyer, travelling extensively, throughout the United Kingdom, Europe and the United States in the pursuit of his own area of expertise – the purchase of paintings. During his forty years at the helm he has made many important discoveries and his instinctive eye for fine paintings is internationally recognised. The elegant gallery, situated in the Victorian premises on Royal Parade is run by wife and partner Helen Sutcliffe, who with a strong family background in the antique trade, and forty years dealing in fine art, has a sound knowledge of 19th and 20th Century British and European Art. Son Jonathan joined the family team in 2011, after gaining first hand experience, following five years in the picture department of a leading London auction house. Based in the London office, Jonathan has brought a fresh approach to the business – his enquiring mind, more youthful eye and passionate love of research and sourcing the artwork is a welcome addition to Sutcliffe Galleries, as they look forward to the future. Sutcliffe Galleries was elected a member of the British Antique Dealer’s Association in 1978. Helen Sutcliffe was Vice-Chairman 2006-2007 and the Association’s Northern Regional Representative 1996-2012.